The mater consists of three layers of brass soldered and riveted together. The rim of the mater is engraved with a scale of hours, divided to 1/15 by alternate shading, numbered from I to XII twice with XII at the zenith. Further to the centre is a scale of degrees divided to the degree and numbered from 10 to 360 by 10 starting from the East point. The inside of the mater is engraved with a 'QVADRATVM NAVTICVM'. Each side of the square is divided to 2 by alternate shading and numbered from 10 to 90 each side from the centre of the side. The coordinates are engraved as 'Latitudo maior aut borealior' and 'Latitudo minor uel Australior', 'Longitudo minor siue Occidentalior', 'Longitudo maior seu Orientalior'. In the centre of the mater is a wind rose for 32 directions, all named in English. North is indicated by a fleur-de-lis, east by a cross, south and west by 'S' and 'O'. The names of the 16 main winds are engraved in Latin and 12 of them (except the ones on the four corners of the square) are also named in Greek. On the bottom of the shadow square is the signature 'Thomas II Anno 155'. The rete has star pointers of the 'wavy flame' type, with a small star at the end of the pointer, for 23 stars all named in Latin. 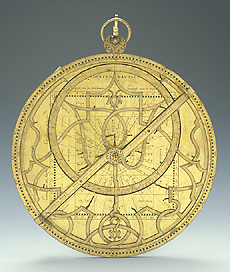 It does not have an east-west line and it is made with the typical overlapping straps, and with a tulip form inside the ecliptic circle. The ecliptic is engraved on the edge with a scale of degrees divided by 1 by alternate shading and numbered from 5 to 30 by 5. The names of the zodiacal signs are engraved together with their symbols and their pictorial representations. The positions of four other stars are engraved on the ecliptic. The meridian line is only on the lower part of the rete and is richly elaborated. The back of the mater is engraved on the rim with a scale of degrees, divided to 1 by alternate shading, numbered in four quadrants to 90 by 5 with 90 at the zenith. The rest of the mater is engraved with a polar projection with lines every 2 degrees in both coordinates and the lines every 10 degrees specially marked. The ecliptic is divided every degree by alternate shading and is numbered from 10 to 30 by 10 degrees. The symbols of the zodiacal signs are also engraved on the ecliptic. The tropic and polar lines are marked with waved lines. The hours are also numbered in both directions from 1 to 12. A diametral rule fits on the back of the mater. It has divisions each 10 degrees wich are numbered from 10 to 90 to 180 on one side and from 190 to 270 to 360 on the other side. To the rule is fixed, by means of a decorated attachment, an arm. The vertical part of the arm is engraved on the edge with a scale of degrees, divided to 2 by alternate shading, numbered from 10 to 100 by 10. It is inscribed 'Cuncta Mathematices nunc instrumenta quiescant, Quot sunt, quot<que?>fuere unquam ceterum atque recentum'. The alidade is counterchanged and the two sights are double. One arm of the alidade has an unequal scale of latitudes engraved on the edge every 2 degrees, numbered by 10, from 10 to 20 for 'Latitudo Meridionalis' and from 10 to 70 for 'Latitudo Septentrionalis'. The other arm of the alidade is divided and numbered on the edge, from the centre, from 2 to 12 for 'Horae ortus solis' and from 10 to 1 for 'Horae occasus Solis'. The central ring of the alidade is engraved with a foliate decoration. There are two symmetrical screw holes on the alidade, whose function is not clear. The throne is circular and engraved with a foliate decoration and the suspension system consists of a sphere fitting in a groove on the throne. The sphere is connected to the ring by means of another ring. There is no wedge but a pin and nut system.